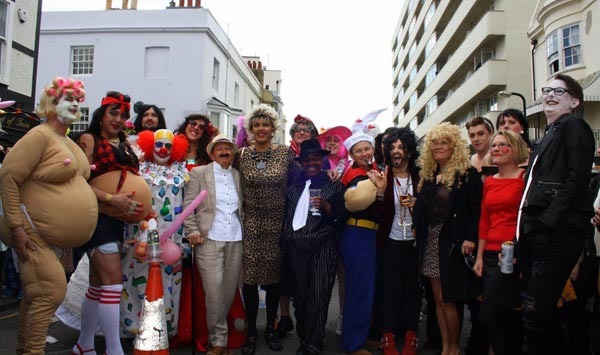 The Bedford Tavern and Grosvenor Bar once again bring you Brighton’s annual Easter Bonnet Parade and Drag Races to raise money for Rainbow Fund. A FUN packed day kicks off at noon on Sunday April 1 when Western Street will be closed to traffic and the street party begins. For the traditional Easter Bonnet Parade which commences at 2pm everyone, both young and old is encouraged to create a fabulous Easter hat to parade down Western Street before being judged and prizes awarded. The infamous Drag Races follow on from after the Parade. A gaggle of Drag Queens and Drag Kings will compete against one another in a series of races throughout the afternoon before the final races see the overall winners crowned. To keep things interesting ‘bets’ can be placed throughout the day and should your runner win the final race you could win one of the amazing prizes on offer. JB’s piano sing-a-long at 5pm leads on to the carnage of The Bedford’s weekly dose of Piano Bingo followed by a fun-filled evening of cabaret. This fantastic community event brings people together and will be raising much-needed funds for local LGBT/HIV organisations via The Rainbow Fund. Registration is now open for Drag Race runners. Anyone over the age of 18 can apply to take part. Contact Adam Brooks on Facebook or The Bedford Tavern for details of how to enter.